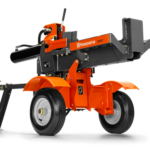 Husqvarna Log Splitter S427 – The Husqvarna S427 log splitter has been designed with productivity and dependability as the driving factors. The Kohler XT engine gives you 27 tons of splitting force at your disposal, so you can handle even the toughest logs with ease. The unit can be operated in either horizontal or vertical mode, and can handle logs up to 25 inches. The unit features a 2 inch tow hitch coupler and can be towed at speeds up to 45 MPH.